What is Westacre? What happens at Westacre and when? Where is Westacre? Well, a warm welcome awaits you at Westacre Theatre which has been offering inspiring, inclusive and creative excellence in the heart of West Norfolk for over a quarter of a century. And Westacre Theatre is probably the only all year-round rural performance venue anywhere in East Anglia. Why? You find Theatres in towns and cities – where there are lots of people. But Westacre is different. In rolling countryside, Westacre Theatre’s scenic setting comes complete with landscaped lagoon. In the Summer, the sheltered South-facing terrace hums with audiences eager with anticipation. Centrally located just 10 minutes’ drive from Swaffham, 20 minutes from King’s Lynn, and within half an hour of Downham Market, Watton, Dereham, and Fakenham it is easily accessible to most communities in West Norfolk. Westacre attracts all-comers so the volunteers, cast and crew are a happy band performing vital roles in its varied activities. Many of the team are long-serving troopers; once at Westacre people tend to stay for the friendship and fulfilment. West End this is not and nor does it pretend to be. But The Westacre Theatre Company perform regularly to great acclaim – straight plays of immense integrity and magical musicals too. As you may expect, Westacre Theatre is more than just a stage. You can hear every word and see every movement from any of its 80 seats. The fully-equipped studio theatre is central to its all-inclusive ethos but there are many other parts too. And the sum of those parts is greater than the converted Chapel where Westacre Theatre was born 25 years ago and is truly a tardis. Its own in-house productions are complemented by sourcing the very best Live! and Encore screenings via satellite from the likes of National Theatre, Royal Shakespeare, The Globe and Matthew Bourne. Fans of mainstream cinema are catered for under the Wednesday Flicks banner showing a carefully selected programme of contemporary films. The Riverside Café-Bar serves relaxing drinks, light lunches and simple suppers. The light and airy Foyer Gallery hosts a continuous back-to-back varied programme of exciting art exhibitions from both up-and-coming and established artists based locally and further afield. Drama workshops are held weekly and in school holidays for young people from 6 to 18 years old. Popular art and craft master-classes are all in the repertoire and often over-subscribed. There is ample free off-road parking (with surfaced spaces by the door for the less mobile). A flat floor throughout (including for a universal access loo) goes right to your front row seat in the Studio Theatre. Give us a look to see what we mean. Performances and activities are presented in three seasons each year so there is always something new about to take off. 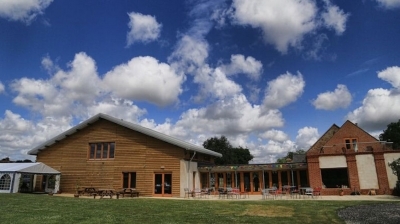 www.westacretheatre.com is constantly updated so a visit there will provide you with the pointers you need about what is in store. But keep checking because fresh productions are being added all the time. And the value-for-money ticket prices have to be seen to be believed. Westacre Theatre is overseen by a charitable foundation so all the support you give to Westacre (just by enjoying a cup of freshly brewed filter coffee, or acquiring that piece of art which caught the corner of your eye) will all go to the worthwhile cause of keeping Westacre Theatre sustainable and alive for the next generation. The cast and crew is a tiny team but they certainly make it all happen. Now they are on your radar, do different and try the Theatre that is different too.